This is David Edwards' web page of cars he has owned and driven. As you will see, there is a strong bias towards English cars, specifically BMC cars, and in particular cars designed by Alec Issigonis. 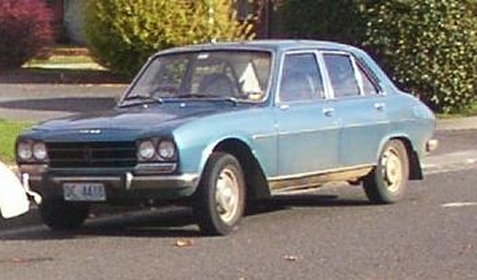 There is also a French flavour, with many Peugeot 504s. If you would like to know more about the mechanical side of cars, check out Chris Longhurst's excellent Car Bible pages. In the suspension page, the section on torsion bars is particularly interesting. 1952 Morris Minor Series MM 2 door sedan (green) This car used to belong to my brother in law Tim Swifte who taught me to drive in it before I even had a learners licence. It had the 918cc sidevalve Morris engine and was one of the first highlight sedans. The instrument panel was in the dash directly in front of the driver. I sold this to buy a green Mini, and the bloke I sold it to busted the gearbox in no time at all. 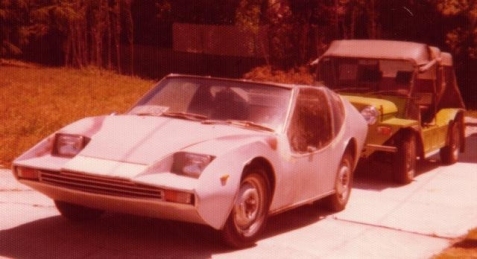 This car had been bought new by Tim Swifte's uncle, who then sold it to Tim's brother David Swifte, who then sold it to Tim, who then sold it to my father who let my sister Robin drive it for a year before he gave it to me. never circa 1971 BLIMP (Buggered Lowered Imp) This is what you can do with a Hillman Imp. My mate Vic Burley owned the Imp, and after he pranged it one day he decided to turn it into a sports car. This involved many of the UTas Engineeing students in lots of fish and chips and hard work. The frame is made of welded steel square tube, while the body is fiberglass. The photo was taken in 1975 while I was in Tassie on my honeymoon. Last heard of, the car was on King Island. 1959 Morris 850 2 door sedan (green) This was a magnificent little car. 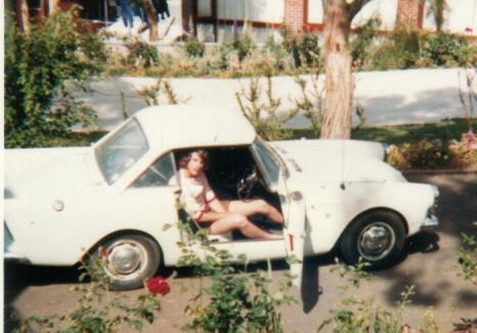 It was an early imported English Mini with sliding windows and rubber block suspension. I fitted Michelin ZX radial tyres, and boy! 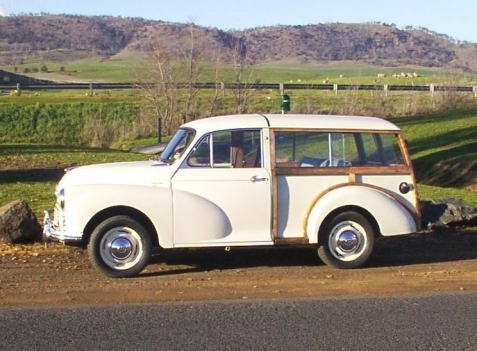 - compared to the crossply retreads on the old Morris Minor, it just flew round corners. Of course, with only 850cc it was completely gutless, but still great fun to drive. I remember passing an FJ Holden on the inside while going round one of the Brooker Highway roundabouts. I let Tim Swifte have a drive one day, and at 20mph = 30kph he thought he was exceeding the speed limit!! 1954? Morris Minor Series II 2 door convertible sedan (green?) This had the 850cc engine, and it was my first sports car - i.e. it had a folding roof!! The clutch slipped like mad, and the floor under the driver's seat was so rusty that the spring hanger banged on the seat frame.You could take 5 engineering students (very slowly of course!) to the beach on a sunny day with the roof down. I only owned this for about 3 months, and I still wish I hadn't sold it. Sunbeam Alpine Series III 2 seater sports car with a removable fiberglass hardtop (white) This had a blocked oil filter (because some klutz had fitted an oil cooler in the line) and a Hillman Minx column change gearbox. The overdrive was missing, but it was a fun car to drive. I blew up 3 engines before the squashed oil pipe was located. It also impressed the girls. I owned this for about a year, and sold it to an Alpine enthusiast I met on the Sydney Harbour Bridge. I believe it has since been fully restored. 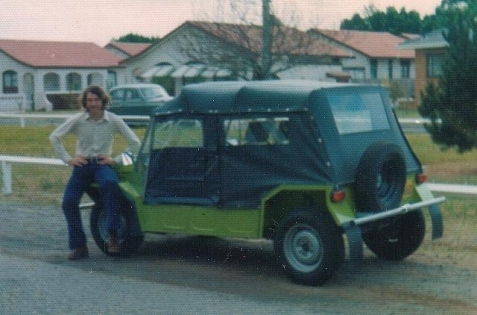 1974 Morris Mini Moke (green, 1098cc, 13" wheels) This was painted "Hairy Lime", and I spent all of $1865.00 to buy it new, along with the detachable side curtains - these were extras! By this stage I had moved to Sydney, and met Kerry, and so I drove it incessantly all over Sydney and NSW. We brought it to Tasmania on our honeymoon, and just had a great time in it. My Mum knitted me two red balaclavas so Kerry and I looked a matched pair. I sold this in about 1978 when I needed the money for a new front fence and decided I didn't really need two cars. 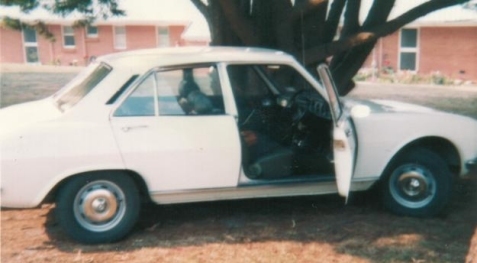 1972 Peugeot 504 4 door saloon (white) This was my mother's car which I inherited after she died. With the 2 litre engine and automatic transmission, it was a 90mph engine in a 120mph body. With 14" wheels, fully independent suspension with 8" travel and four wheel disk brakes it was just magnificent to drive in the country. 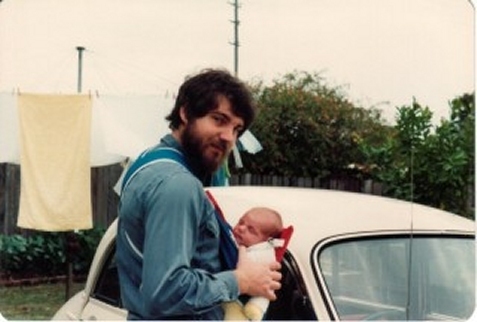 Kerry eventually learnt to drive it when she was expecting Alexander in 1979. We brought it with us when we moved to Tasmania, and I finally sold it after it had done about 200000 miles and was terminally overheating. 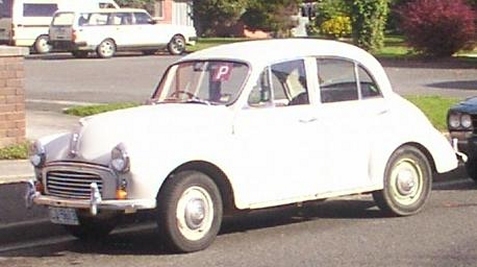 1959 Morris Minor 1000 4 door sedan (white, then "no glow" grey) When Alexander was born, I realised I needed another car, because Kerry was going to use the white 504. 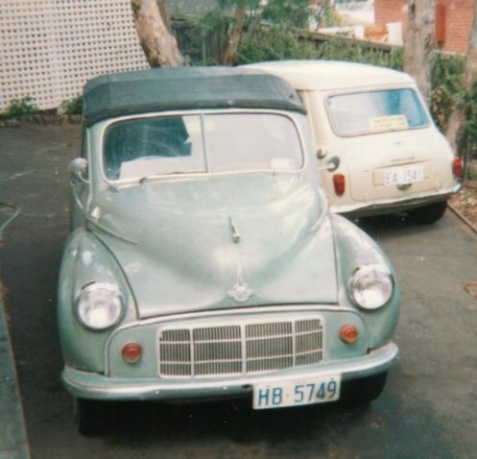 So I bought this 1961 Morris Minor 1000, and then joined the Morris Minor Car Club of NSW (I'm still a member!!). There were so many things wrong with this car that I decided I would just drive it and fix things as they broke. For the first year it was nearly one thing a week (but in one memorable week, all 3 radiator hoses broke, one after the other - thanks for the loan of the lunchbox, Lloyd!!!!) but for the next four years I had a very reliable car. I only sold it when we moved to Tasmania in 1985. 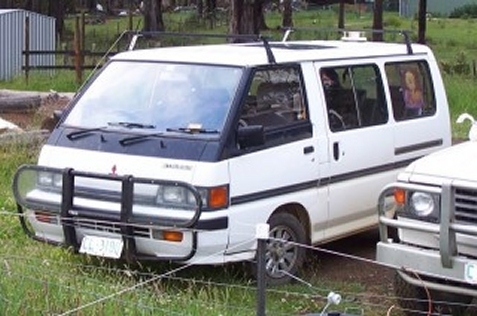 1988 - 2003 1988 Mitsubishi Starwagon (white) This great white van with electric door locks and an electric sunroof was the means of carting the family (2 adults, 4 kids + 2 extras sometimes) all over Tasmania and south eastern Australia. I sold it to Alexander for a good price (for him, not me!!) when I bought the Traveller, so I get to borrow it back on occasions. 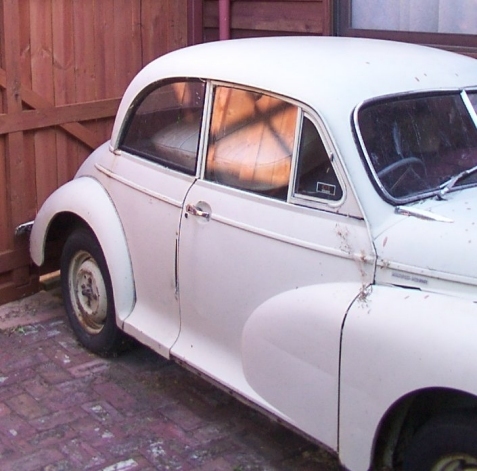 1996 - present 1961 Morris Minor 1000 4 door sedan (white with a rusty right hand rear mudguard) I bought this one when Alexander had just turned 16. He and I fixed it up, and now all four children (Alexander, Christopher, Phillipa and Victoria) have learnt to drive in it. Most of the mechanics have been done up, it has a reconditioned motor with a Morris 1100 head and 1.5" Mini carby, as well as Morris Major drums on the front and Morris major wheels on the rear. 1997 - present 1952 Morris Minor Series MM 2 door sedan (yellow) This is future restoration project which has been gathering dust since I bought the Traveller. It is handy for spare parts for the other Minors. The body is the same as my first Minor - 2 door sedan with highlight headlights (in the midguards not the grill) and the instruments (speedo, fuel gauge, oil pressure gauge) in front of the driver. 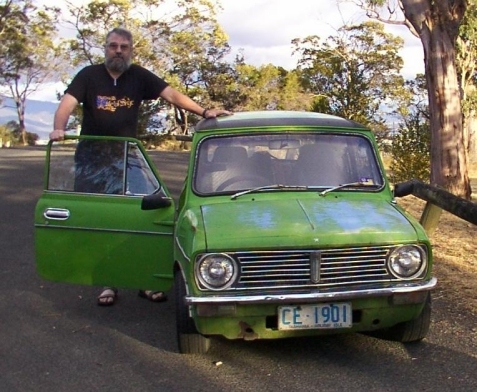 1998 - 2006 1976 Leyland Mini Clubman (green) This had a bored out 1275cc motor, and was a great little town car. 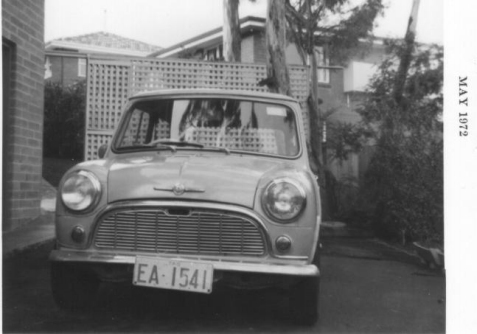 It looks daggy (it lived on the street, so I didn't worry about it), and just like my first Mini, it had rubber block suspension - but went a hell of a lot faster. It finally succumbed to a cracked crankshaft and low oil pressure, so the car was scrapped, but I am sure the motor will eventually live another day. 1998 - 2002 1986 Peugeot 504 Automatic 4 door sedan (blue) This 504 replaced my Mum's white one. The body was quite good, but the engine was never much good. I eventually sold it after it developed terminal overheating. 1982 Peugeot 505 GL Automatic 4 door sedan (white) This one cost $1300, and went well for 3 years. The electric windows and door locks were very unreliable, and eventually it blew the head gasket - terminally. I sold it the wreckers for $200 and then got $250 back on the rego. This is an imported English car and has the original 1098cc engine and the baulk rink syncro ribbed case gearbox (i.e the one where the syncro works!). I bought this fully restored (or so I thought at the time). The body is very good, but the wood rot is progressing. It has had a few mechanical problems, but I am working on these. 1975 Green Peugeot 504 GTI (fuel injected) fitted with 5 speed 505 gearbox I paid only $900 for this beauty, and with the $450 I got for the white 505 (see above) which preceeded it, the net cost was less than $500. I said at the time that if it went for a year I would be laughing all the way to the bank!!! 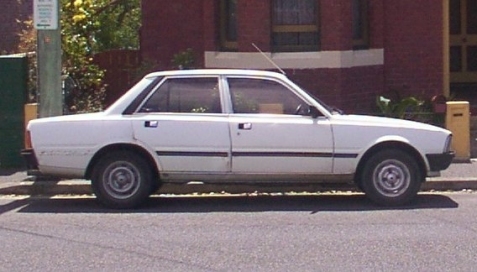 After 3 and a half years of excellent motoring, including a trip from Hobart to Sydney via Bass Strait, as well as several trips to the Hunter Valley, this car was retired in October 2008. 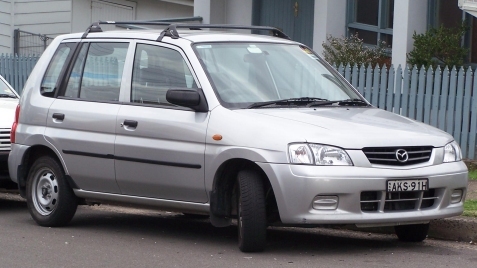 I got $750 for it in total, including cashing in the rego and the insurance refund, so it was definitely cheap motoring, as I didn't spend much on maintainence at all. The motor and gearbox have gone to a Peugeot enthusiast in Sydney, and the body will go to Egypt to be recycled as a taxi. This car was generously loaned to Kerry and I by Hal and Peta Colebatch, who had the misfortune of needing to spend the Australian winter in France!!!. We found it to be a pleasant, practical car. 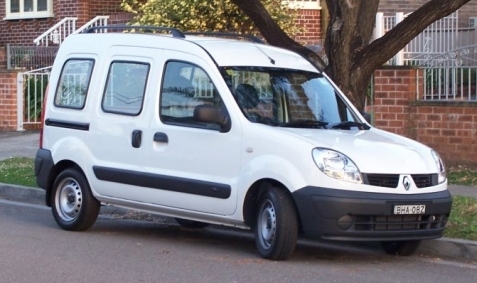 With 6 doors, electric windows and mirrors, central locking, air conditioning and a proactive 4 speed automatic gearbox, it is very pleasant to drive and very economical.